That's how long it's been since we packed up our little apartment in inner-city Melbourne, sold most of our possessions, zipped what was left into our backpacks, waved goodbye to our families at the airport, and boarded a flight to Singapore with a one-way ticket. Some days Melbourne feels close, as though we only left a few months ago. Other times, we think about our friends (who mostly waited till we'd left to start getting married and having babies! ), our families, or our favourite hangouts and all of a sudden our former lives feel so much farther away. One thing's for sure though; we packed a whole lot of living into the past 12 months. We explored 28 countries together, travelled over 50,000km, met incredible people, ate all the food, and lived the life we'd been dreaming of for years. The past year threw both challenges and laughing fits, exciting adventures and a couple of lows our way - but most of all, it became our ultimate teacher. We learnt about people, the world, about life. Sometimes it was exactly what we needed, other times it snuck up on us at unwanted times with unwanted truths. There were times we were uplifted, our faith in the world restored - and times we discovered things we couldn't unlearn or un-see. When it comes to travel, we always have this postcard perfect image in our minds of how it’s going to go. We’ll be happy, the sun will always shine, the words discomfort, boredom, or danger will cease to exist. We always seem to forget that when we travel, we take ourselves with us. The travelling versions of us still get tired and hungry, bored and grumpy. Your enjoyment on the road comes down to your attitude, and learning to accept that not every day will be painted with a utopian glow. Happiness comes from appreciating every moment for what it is (good or uncomfortable! ), and being grateful that you’re one of the lucky ones who gets to travel in the first place. * Check out Alain de Botton’s Art of Travel for more on this! For whatever reasons we create or routines we build for ourselves, sometimes life can start feeling rigid and unforgiving. Even if we hate our jobs, our relationships are failing, or what we’ve chosen to do isn’t working out, we stick with them for fear of the unknown despite being unhappy. Travel teaches you there’s another way, and it all comes down to fluidity. Don’t like a country? Move on. Fallen in love with a place and don’t want to leave? Shift your itinerary around and give yourself an extra few days to enjoy it. You’re in control, no matter what your circumstances. Own it. But as you get closer to different cultures, places, and ways of seeing, you come to realise that the mere fact that so much life even exists (in all it’s weird and wonderful ways) on this pale blue dot is nothing short of incredible. Surviving a year of living out of one backpack makes you realise how much needless baggage you collect and carry through life. You’ll learn to love your 2 minute beauty routine in the mornings (a cold splash of water), not having to stress about what to wear (you’ll only have 4 outfits anyway), and being able to visit a new country with an hour’s notice! All you really need in life is a roof over your head, some food, a warm jacket... and maybe a deck of playing cards. If we’d listened to other people’s opinions on how we should live our last 12 months, we’d literally have missed out on the world. We’d be stuck in jobs we enjoyed but didn’t love, only living the way we really wanted on the weekends and 4 weeks of leave each year. Instead, we had the best year of our lives, made new friends, discovered the magic of nearly 30 countries, changed our perspectives, and learnt new things every single day. We enjoyed life entirely on our terms, and wouldn’t change a thing. Be fearless about living the life you want, and never defer your happiness because someone else thinks you should do it a different way. Everything becomes magnified when you travel. Sights get brighter, sounds louder, and the bonds you form are simultaneously the most intense, yet brief, you’ll ever have. When you only have a few days with someone, you learn to love hard, celebrate each day together, and let go (often in the same week). But while your travel friendships might burn and fade within the same country, those memories aren’t going anywhere. One of the exciting parts of travel is discovering how the rest of the world does it. Sometimes, you’ll discover their way is actually better, other times you’ll discover it’s really different to what you’re used to. Buses might not leave for hours after their departure time, things don’t happen as quickly or easily as you’re used to at home, the simple task of buying groceries is obstacle-filled because you don’t know the language or procedures. Get to know zen you. Take a deep breath, give your skills in patience a workout, and smile. Who said a 3 hour wait for food was really a big deal anyway?! There’s a lot of talk in the world right now about evil and the people perpetrating it. Tell you what gets no air time? The extraordinary kindness of humans all over the world. Our greatest experiences on the road came from the genuine kindness that locals showed us and the connections we made. Smile more, love harder, understand better. Your best laid plans will always go awry, you will lose vital pieces of luggage or equipment, you’ll get stuck late at night in a town where no one speaks your language. Let your creative light shine, and come up with solutions using the resources you have around you. In Myanmar, while Mark was laid up in bed (read: the bathroom floor) with a nasty parasite, I had to run down to the chemist to get some antibiotics and electrolytes. The problem was, they didn’t speak a word of english - which which lead to five of the most mortifying minutes of my life as I acted out the process of a stomach bug for them. All while they fell about themselves laughing. We got the antibiotics, and Mark got better… Until he got sick again a week later. Sadly, travel opens your eyes to how poorly we treat our home. Deforestation, pollution, mining, climate change - we are stripping our planet bare and breaking her beautiful heart. It’s near impossible to see all this and not be affected in some way. We definitely leave a smaller footprint these days; we live clean, make decisions based on how they’ll impact our environment, and probably the biggest change of all - we both became vegetarian. You certainly don’t need to go as extreme as cutting a food group, but making small choices every day that benefit the world goes a really, really long way. 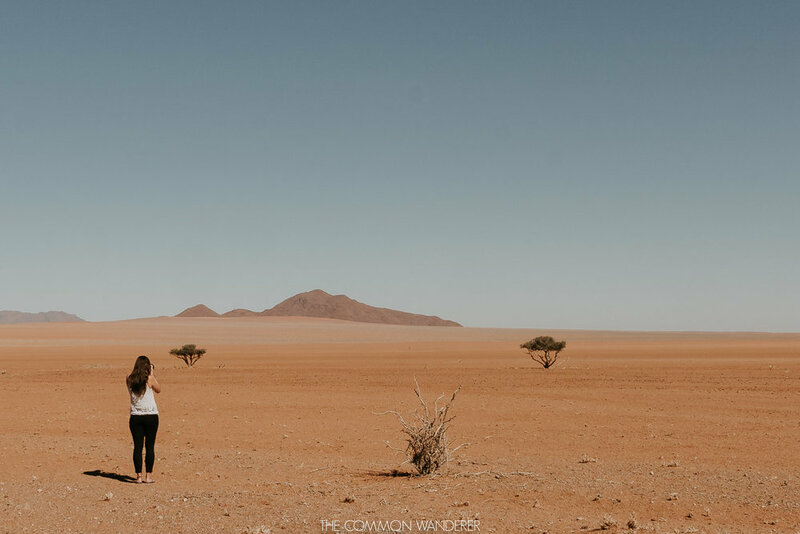 Stand under the night sky in the Namibian desert, trek amongst the towering Himalayan mountains, lie on a beach and watch the waves that have circumnavigated the world break on the sand. Take in the remoteness, the vast open plains, the incredible work of Mother Nature. Realise that you’re not the centre of the universe, but you are made of it - which makes you a small, special part of it all. Honestly, every single day, millions of people board buses, planes, trains, tuk tuks, bicycles, and ox drawn carts in search of something new; stability, freedom, adventure, comfort. You’re not the first person to travel, you certainly won’t be the last, and plenty of trailblazers have carved out the paths before you. You’ll soon realise that all the worry, fear, or doubts you have about making the trip into the unknown were for nought when you’re having the adventure of a lifetime! What are the travel lessons learnt from your travels?! Share your story with us in the comments below! find more travel inspiration below!